8) What doesn’t matter, is that my grandpa is old and fragile. What really matters, is that he thinks he is still young and agile. Happy birthday. 9) Just like how the beautiful grandfather clock is the pride of our living room, you are the pride of our lives. Happy birthday grandpa. 10) Our relationship is truly mutual because you understand me more than my parents do, and I understand more thank your kids do. Happy birthday grandpa. 11) Majestic, magnificent, splendid, impressive and striking are a few synonyms of the word Grand. No wonder I call you Grandfather. Happy birthday. 12) Do you know I have learnt the art of giving from you, grandpa? You always gave me the candies that my mother never allowed me to have. Happy birthday. 13) One more magnificent year has just been added to your life. Your journey is nothing short of glorious, passing through hurdles and strife. Your inspirational life story is simply beyond compare, keep living with your unmatched zest and flare. Happy birthday. 14) You were one of the first ones to cuddle me after birth and our sweet bond has remained intact ever since. Happy birthday grandpa. 15) Your birthday gift is a small token to say thank you for saving me so many times for being grounded. Happy birthday gramps. 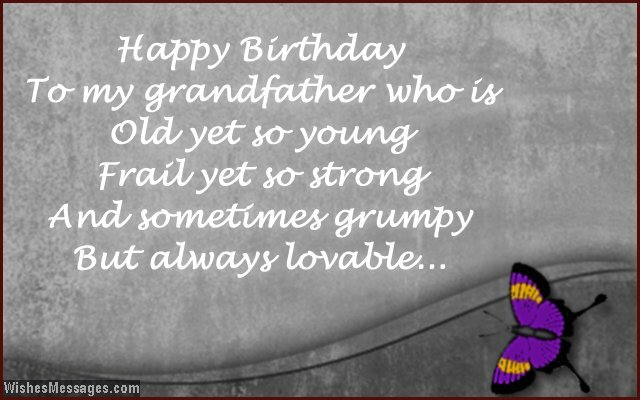 16) Happy birthday to my grandfather who is old yet so young, frail yet so strong and sometimes grumpy but always lovable. 17) When I was a kid, you taught me how to ride my scooter. When you retired, I taught you how to use your computer. Cheers to our wonderful relationship as grandkid and grandfather. Happy birthday. 18) For you, babysitting me was never a chore. For me, spending time with you was never a bore. For you, I am your cute little grandkid. For me, you are my grandpa – fun and vivid. Happy birthday. 19) Dear grandpa… you may not be the fastest and strongest, but you will always be the cutest and sweetest. You may not be the newest and youngest, but you will always be the coolest and bestest. Happy birthday. 20) You helped me to walk when I could hardly take a step as a baby. When you become old and fragile, you can count on me to do the same. Happy birthday grandpa. 21) Mom never put me in day care because you were always there. I had a happy childhood because we were the most fun pair. Happy birthday grandpa. 22) I think we both have the perfect partnership. As a grandparent, you love spoil your grandkids and as your grandchild, I love you to be spoiled by you. Happy birthday. 23) Dear grandpa… your birthday must be a huge celebration because if you weren’t born, my mom wouldn’t be born and if mum wouldn’t be born, I wouldn’t be born. Happy birthday to the root of my existence. 24) The best vintage wine of the world may be aged, matured and textured to the finest balance – but so is my grandpa. Happy birthday. 25) Having you in my life is like having a best buddy, uncle, father, counselor and a grandparent, all in one. Happy birthday grandad. 26) If I was asked to go back in time and live the life of one person in my family, I would pick you because you inspire me the most. Happy birthday old man. 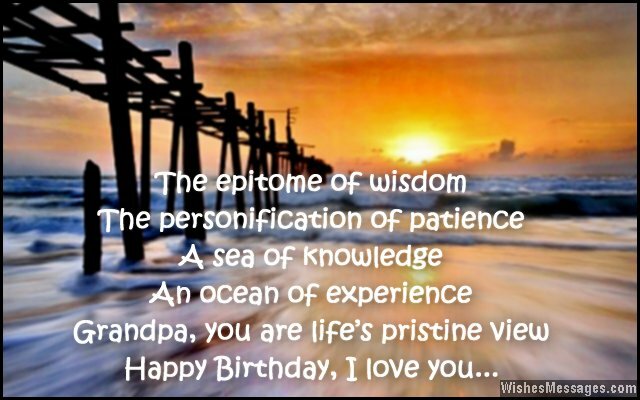 27) Dear grandpa… you have immortalized yourself by being a permanent fixture in my childhood memories. The awesome times we have had and continue having, are some of the best moments which I will cherish when I become as old as you. Happy birthday. 28) Happy birthday to my mind reader, my life coach and my go-to guy for everything in life. I love you grandpa. 29) My biggest inheritance from you will be all the love you have showered on me all my life. Happy birthday grandad. 30) I hope I can have the same energy and zest for life that you have right now. Happy birthday to the most active grandfather in the world. 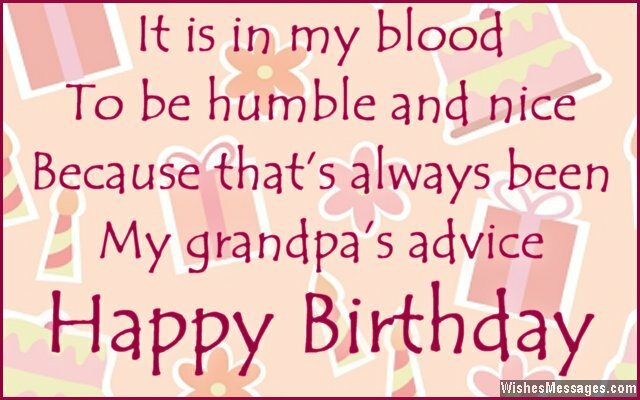 31) It is in my blood to be humble and nice, because that’s always been my grandpa’s advice. Happy birthday. 32) From helping me with homework to helping me get out of being grounded – we are the best partners in crime ever. Happy birthday grandpa. 33) If I had my way in the house, you would be my roommate. Happy birthday to the most fun grandad ever. 34) Thank God I was born in this family otherwise how would I have ever inherited your awesome genes? Happy birthday grandad. 35) You have filled in my parents’ spot every time they have not been around. This makes you my Parent No. 2, not my grandfather. Happy birthday. 36) I have always believed that a grandfather is a dad who never punishes me, never shouts at me, never grounds me and always showers me with gifts. Happy birthday gramps. 37) Your GRAND presence and GRAND advice has made a GRAND difference in my life. Happy birthday to the GRANDfather who has a GRAND impact on everything he touches. 38) My grandpa debunks the myth that old people are supposed to be slow and grumpy. Happy birthday. 39) Grandpa, grandad, grandaddy, gramp and grandpap – I have called you by many names over the years but your presence in my life as a second parent has been constantly the same – nurturing and loving. Happy birthday. 40) I don’t know how to explain how much you mean to me. Maybe you will get the picture if I say that in my life’s complicated jungle, you are like a protective tree I can always rest under. Happy birthday.